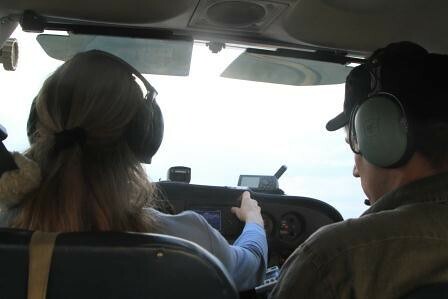 A while back, Jonathan Henderson and I were graciously invited to fly with Bonny Schumaker and On Wings of Care, in order to scope for whale sharks, to document an ongoing oil release from one of the 27,000 abandoned wells in the Gulf, and to check on the land built by the West Bay Diversion. The flight was an amazing experience, a reminder of what beauty the Gulf holds, the vast and multitudinous threat that beauty faces, and the immediate need for an RCAC, a citizen’s group to fly the Gulf and witness for it. 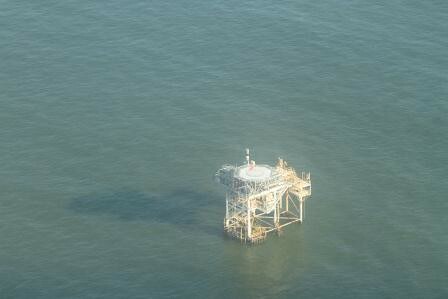 Taylor Energy’s 30 mile long oil slick, off of the Birdfoot delta. What we saw on the flight was as important as what we didn't see. Bonnie was concerned about the lack of dolphins, and about a general lack of wildlife around Ewing Bank, a placed she is accustomed to seeing teeming with life. She repeatedly mentioned the fact that we should have been seeing dolphins on such a beautifully clear day. Flying to Terrebonne from Lakefront Airport, we first reviewed the legacy of oil and gas destruction upon Louisiana’s coast, from the canals to the interior subsidence-a forced drowning of the fresh and brackish wetlands due to oil and gas extraction, to exterior areas where erosion is the name of the enemy. Pipelines and pipelines and the occasional shipping channel, all piercing into the heart of this Good Earth, are allowing saline Gulf waters and tidal Gulf forces to tear Louisiana apart bit by bit, like a threadbare shirt that can’t take the washing machine. 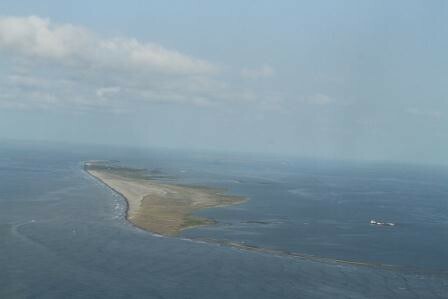 We also saw the humble human triumph of restored barrier islands, as we flew west of Trinity Island in the Isles Denieres. Here, waters of the Delta were greenish where once they were muddy with sediment falling from of the five fingers south of Houma. As we moved from the Delta into the Gulf proper, we moved from the oil industry's past, destroyed marsh and thousands of keyhole canals, to the oil industry's present-day rigs, where many Gulf residents risk their lives for our transportation, the loneliest gas station attendants in the United States. We spotted the Sargassum line far out from where it normally runs, says Bonnie, undoubtedly due to the high-powered river of 2011 pushing the seaweed and all of the critters that thrive in it and follow it out further over the shelf. Five, then eleven, then three hammerhead sharks schooled in their slithery way near the surface of the water. Groups of sea turtles, small like Kemp's Ridleys, flew through the water in parallel to the line seaweed. Flotillas of Rays. 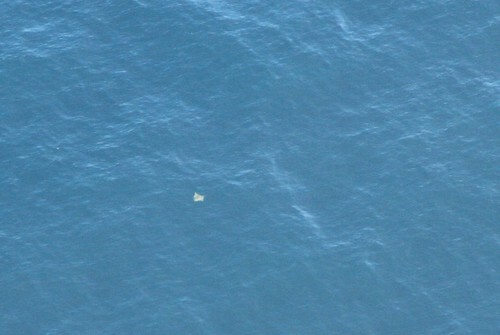 Jonathan snapped this picture of a sea turtle from a thousand feet. Bonnie caught sight of a jumping Bluefin tuna, a species that spawns in the Gulf to the west. We came over a flotilla of shrimp vessels dragging amid the oil rigs, within the Sargassum lines. When we finally came to the Sargassum border, the water suddenly turned from a muddy, murky dark brown-green into a deep iridescent blue, a shimmering blue like a blueprint bathed in refracted sunlight. Against this backdrop we saw clearly when a sea turtle or school of sharks swam underneath--we could see at least a few fathoms into the deep blue water. As we arrived closer and closer to the reefs and rigs off Ewing bank, our searching stares into the waters became hypnotizing. Where was Bessie, the whale shark we had flown to see? I began to imagine shapes in the surf. Ultimately, we saw only the gentle dance of the waves playing with the morning sunlight. 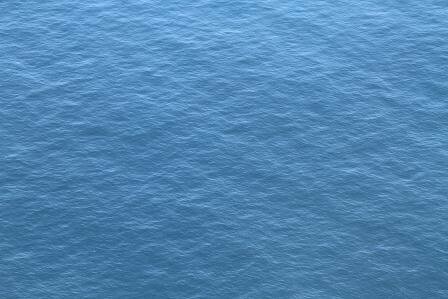 Although beautiful, it felt lonely staring into the abyss of the Gulf with no fellow animals to greet us from below. What we did witness were the rigs and supertankers of Ewing bank. Most of the ships were floating high in the water, with only one green-hulled tanker sitting low, heavy with oil. 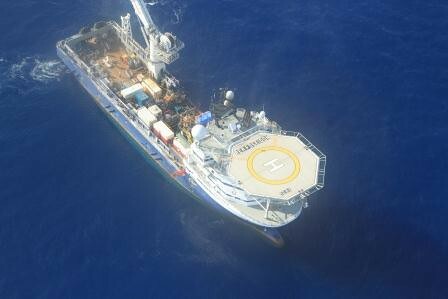 An oil exploration vessel upon the still Blue waters of the Gulf. Not a whale shark. We circled several times to in search of the whale shark, but eventually quit and headed east to search for an ongoing oil leak begun in 2004 with hurricane Ivan. 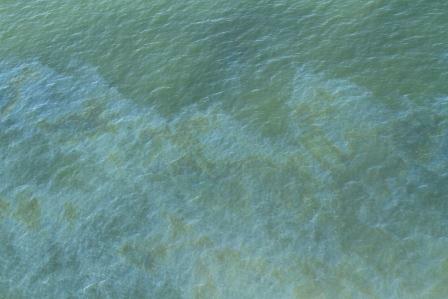 As we passed back over the sargassum line, I thought we should be seeing algae. 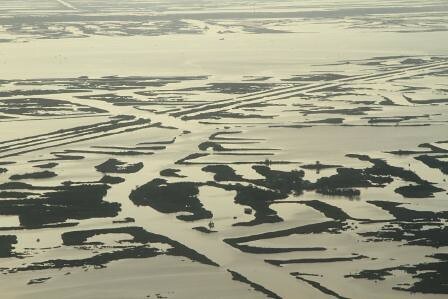 At first, we came back into the muddy waters of the coast-the brown, muddy waters–now with a green tint. We saw what looked like remnant tar patties --left over from BP’s wild well, floating just under the surface, usually in clumps the size two or three sea turtles. Before I spied any telltale algae mats, we came over the oil slick, the sheen reflecting all the colors of the rainbow. The sheen was one hundred feet across and stretched east over the horizon as far as our airborne eyes could see. We circled over the abandoned well, marked with a mere orange buoy. Where were the cleanup crews? The Rig to drill the relief well? The skimmers, the tankers? Without our appearance, would anyone know about this, one of many instances of our Gulf treated like an auto parts parking lot? We turned toward the birdfoot, and I spied some algal mats floating on the massive plume of fresh water. 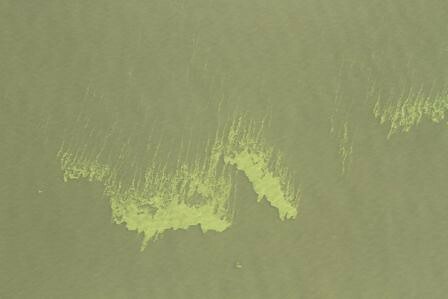 This algae, fed by a broken agricultural system, will die, sink, and be consumed, and most of the shelf’s oxygen with it. 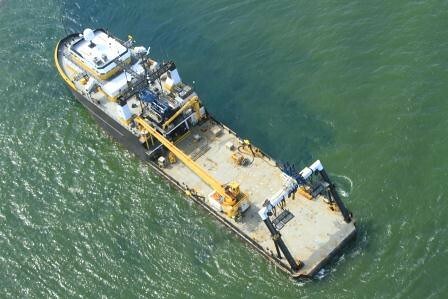 But it was the current “shadow” in the lee of an exploration vessel that made me realize just how green the water was. 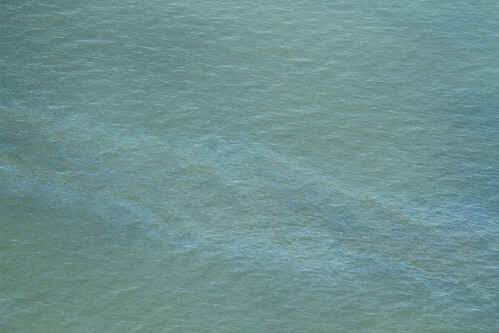 Here is a shot of a vessel disturbing the algal bloom, which must have stretched for miles and miles. For the last leg of our journey, we came over a very important hole in the levee-the site of the West Bay Sediment Diversion. 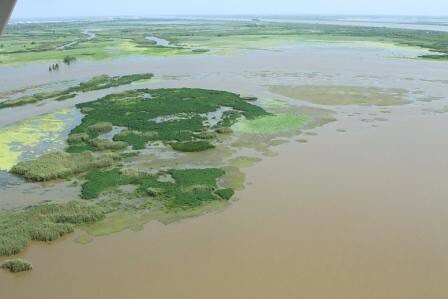 Although the Corps, following its allegiance to shipping, would like to close the armored Gap that is creating new fresh marshes in the rapidly subsiding delta south of Venice, we hold on to hope that they get their priorities straightened, and allow the river to do its thing, create the mudslide that brought south Louisiana onto the maps. So much of what happens to the Gulf of Mexico is reflected in the color of its water. But if no one is looking, there will be no one to tell the Oil and Gas industry to clean up their act. This is why an RCAC, a citizen’s group for the Gulf, is so necessary, and long overdue. Scott Eustis is GRN's Coastal Wetlands Specialist. thanks to Rowan Jacobsen.